Looking for the perfect shoes to tackle the Appalachian Trail? The A.T. has called out to countless people over the years, and many have accepted the challenge. Roughly 25% of people who set out to hike the entire distance end up completing their goal. That is higher than you might expected considering how challenging it is. ...and the right type of footwear won't hurt, either. Now get ready, because you're about to discover the best ​hiking shoes for the Appalachian Trail. 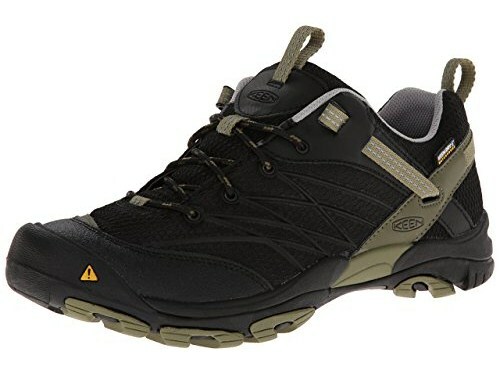 **Below, you'll find our detailed reviews, but you can also click the links above to quickly check the prices of our top hiking shoe picks for the Appalachian Trail. In 1936, Myron Avery became the first 2000-Miler to hike the full distance of the Appalachian Trail. 5 people hiked the entire distance in the '30s, and only 3 in the '40s. It wasn't until the 1970s that there was a decade were more than 100 people completed this daunting task. In total, just over 15,000 people have completed one of the world's most famous and challenging hikes. What's the point of this history lesson? While every single one of those people were unique and had their own methods an d styles, there are certain things that are universal, like taking care of your feet by having the proper footwear. Family obligations, injuries, running out of money, and unmet expectations are among the most common reasons for people not completing their hike. Certain things are out of our control, and that's part of what makes hiking the adventure that it is. But, for the things that are not out of our control, it's important to take them seriously. In order to increase your chances of success, it's wise to do a lot of research, and one by one, to eliminate any potential 'weakest links' in your plan. For starters, having the right gear on your feet can help to prevent a variety of injuries. Earlier, we talked about the amount of people who have traversed this entire course. Some of them did it wearing hiking boots, some of them did it wearing hiking shoes, and none of them are wrong for having done so. It's a very personal choice, and I'm not going to tell you one way or the other which way to go when it comes to Appalachian Trail shoes vs boots. If you're interested in boots for the Appalachian Trail, see our previous guide on that topic. Before we dig our heels in too deep on the topic of footwear, let's cover some camping gear and budgeting basics. The goal here isn't to provide you an extensive guide to all of the gear you need to hike the Trail, but rather to make it clear how necessary it is to put a lot of thought into it. There's all of the obvious stuff that comes to mind when packing, but what about buying an insulated sleeping mattress for camping? What about memorizing a few ghost stories to share with the friends you'll meet on the Appalachian Trail? You can expect to spend about $1000-$2000 on gear, depending on how thrifty you are. Also, it's recommended to budget around $1000 per month, depending on what your plans are for food and accommodation along the way. Thru-hiking the Appalachian Trail takes about 5-7 months on average, but you can avoid one of the more common failure-points by ensuring you've budgeted extra money for the unexpected, and simply not been overly optimistic with your budgeting either. Many people end up over-packing with gear that's too heavy, only to replace it item by item as they travel along. It may seem like you're saving money on some gear that is 'good enough' instead of 'ideal', but at the end of the day it's cheaper just to buy it right the first time. To paraphrase the ever-wise Bob Marley, your feet are going to be your only carriage. The only things standing in between your feet and the trail are your hiking shoes. Since you're here, we're going to make the assumption that you've chosen to go with hiking shoes over hiking boots, or that you're still researching. In any case - it would be a disservice to our readers to feature anything besides the best shoes for hiking the Appalachian trail. You will end up going through multiple pairs of shoes while on the trail. It can be difficult to purchase more than one pair ahead of time, because after clocking a few hundred miles your feet may in fact be larger. Some people have feet that grow during the hike, others don't seem to experience this as much. In any case, hiking shoes are a good choice when it comes to Appalachian trail footwear because they're easier to replace than boots. With a pair of boots, you'll often have to break them in a bit first - a luxury you won't really have when you're already in the middle of a tough hike. It's important to start off with the best hiking shoes for the Appalachian Trail because after those first 300, 400, 500 miles... you'll start to rely a lot more on your mind and mental toughness than your shoes. But to get you going from the start? Take all the help you can get. Shoes are lighter than boots, and that little bit of weight can make a difference when you're lifting your feet so many times, over and over, all day. Hiking shoes are more durable than runners, without as much support as full-on boots would provide. It's a good middle-ground, if you're stable on your feet, and don't need the added heft of a boot. Hiking shoes are ideal for more experienced hikers who are sure of their footing since the added support of a full boot can potentially help protect against a twisted ankle, for example. With a bit less support, they're also more suited to hikers carrying lighter packs, which should be a major goal when it comes to gearing up. It's a good idea to look for shoes with a waterproof membrane. A common mantra on the trail goes "No pain, no rain, no Maine." One of the benefits of shoes over boots is that you're going to be going through numerous pairs, and hiking shoes are less expensive that boots. We've put many shoes to the test, and these are the ones that came out on on top, so that you can too. 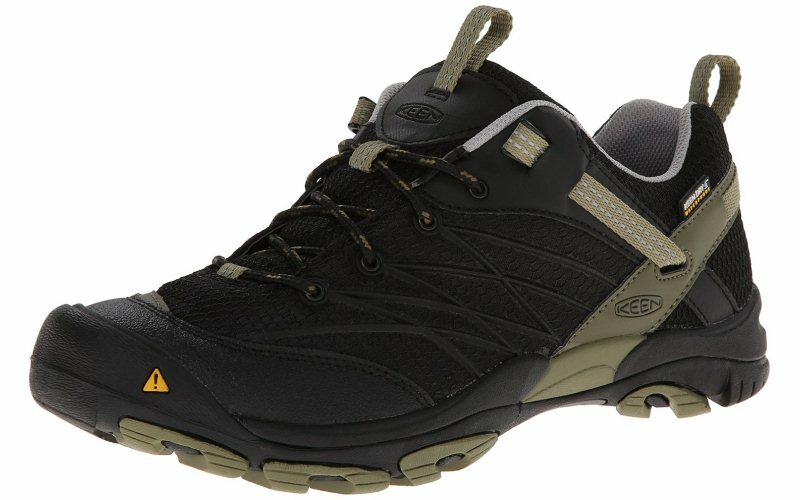 The Marshall WP Hiking Shoe by KEEN is everything we would want a hiking shoe to be. It is roughly half the weight of the other two men's boots on this list, which each have a shipping weight of 4 pounds while this pair is a mere 2 pounds. There are three different colorways available and they each look excellent. Despite their lightness, these hiking shoes still feel rugged-capable and solid. 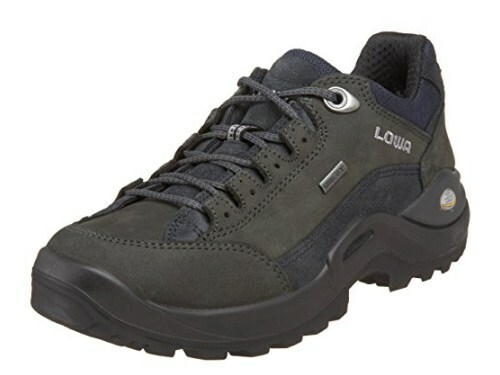 They offer great breathability, while remaining totally waterproof, thanks to their Gore-Tex lining. Salomon have a reputation for making quality gear at a fair price. 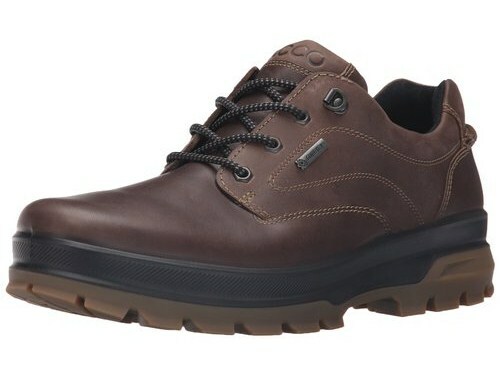 These men's shoes in particular are very well-made, giving you the durability of a full-grain leather construction, with some breathability to keep your feet a little cooler. The contagrip technology on the outsole comes in handy, especially in muddy or slippery situations where grip is essential. These men's trail shoes by ECCO are on the heavier end of the spectrum between shoes and boots. They have a thick, grippy sole without the added height of a boot. Rather than boasting the latest synthetic fabrics, these are made from the fine leathers which have put ECCO on the map as a name you can trust for high-quality footwear. 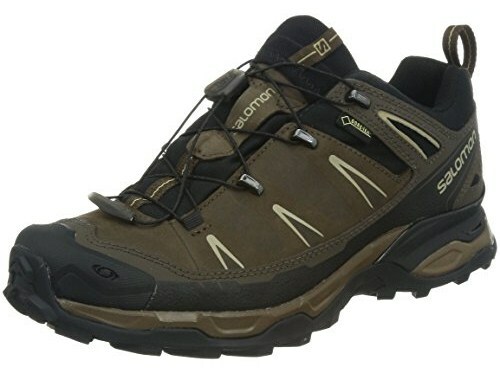 These hiking shoes are available in both brown and black, under the names 'dark clay' and 'coffee'. Style-wise, they're fairly plain and standard, and there's nothing wrong with that. 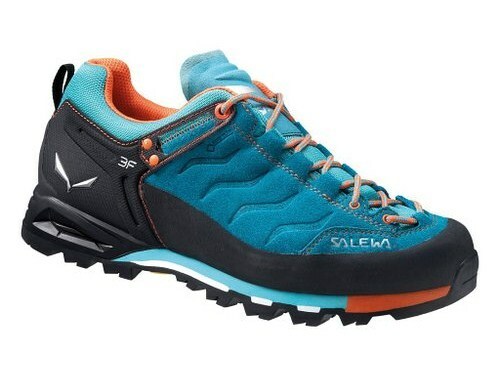 Here is Salewa's take on a hiking shoe. This shoe has things like a full rubber rand that goes all the way around, a 3F EVO heel, a modular footbed, and climbing laces. These are a stark contrast to the more 'plain' or classic leather style boots and shoes we've featured throughout our Appalachian Trail footwear series. The Renegade II GTX LO by Lowa is a woman's hiking boot, but you wouldn't be able to tell just from looking at it. There's no pink highlights, purple laces, or anything like that - despite there being 4 unique colorways to choose from. These shoes are dark and organic looking, it's as if function was the top priority rather than looking stylish or cute. The heel is about an inch in depth, and these shoes feature a PU Monowrap Frame midsole, which should help with support and stability, which these shoes are not lacking in despite their light size. 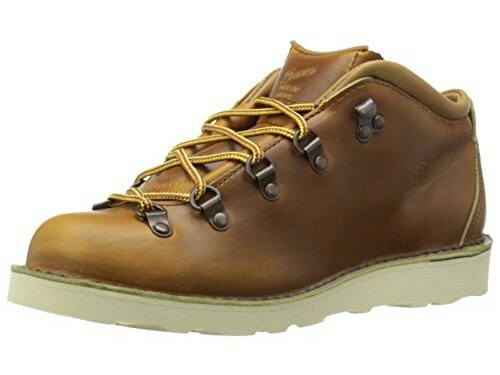 Danner have built up a reputation over the decades for making excellent boots, and this pair is no exception. Wait a second - why is there a boot on this list of walking shoes? Compared to many hiking boots, this pair is quite light and frankly hits more of the notes you're looking for from a shoe, than a boot. If you've seen our list of top hiking boots for the Appalachian trail, you may recall that a pair by Danner were the top pick for women. Compared to those, these are much lighter, with a lower back. Nonetheless, they have the same Made in USA quality and durability that you'd expect from this brand. One of the things we had to ask ourselves while comparing these hiking shoes in order to choose the best pair was whether or not they were trying to be "kind of" boots and "kind of" shoes at the same time, and trying to appeal to people who haven't made up their minds yet. We're working under the assumption that you are looking for hiking shoes, and if that's the case - you could strongly consider this pair right here. From the supportive strap, the tear-resistant breathable mesh, and the great waterproofing, to the weight and overall value, the KEEN Marshall WP is our top pick for men. This is a serious shoe for serious hikers. Salewa's MS Mtn Trainer GTX model has some smart features such as an adjustable insole, and well-placed laces, but it's not any kind of gimmick that gave them our top position. This is a quality hiking shoe for women who want something a bit more agile and modern than some of the other top options, and overall they're our top pick for best hiking shoes for the Appalachian trail.